This article on dividend traps was originally written and published on January 18th, 2009 in the midst of the worst stock market meltdown in generations. It has been archived, with slight updates to improve readability, expand on certain ideas, and links to related topics, to provide some perspective about how, even in the midst of the world falling apart around you, you should insist upon long-term, fundamental quality in your holdings. Sometimes, a great bargain isn't actually as attractive as it appears. Right now, a glance across the stock tables shows companies trading at 3-4x earnings with nearly 10% dividend yields – or more than twice the funding cost of a 30-year fixed rate mortgage. That sort of value situation hasn’t existed since the horrific crash of the 1970s, yet that doesn’t mean you should go out and start buying everything you can get your hands on, especially if you are vulnerable to job loss or don’t have excess cash on hand for emergencies. Yes, there are tremendous values. Yes, at my companies, we have taken advantage of the situation by expanding the operating businesses and using excess cash flow to buy stocks. 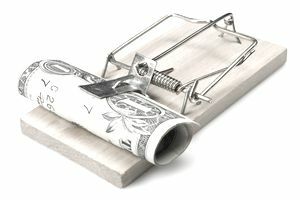 However, we are fully aware that there is a very real potential for what is known as the dividend trap. What is the dividend trap? Put simply, a dividend trap is a phenomenon that occurs when the stock price of a business that pays a dividend declines more quickly than the reported earnings. This results in the p/e ratio looking lower than it actually is, and the dividend yield, which may not be sustainable, appearing higher than it is likely to be going forward into the future when a dividend cut may become necessary for the sake of protecting the company. Experienced investors and traders, who drove down the stock price, know this. It is the inexperienced investors rushing in to buy what they think is undervalued equity that is likely to suffer harm. An illustration might help you understand how this could look in the real world. Imagine that your family is the controlling shareholder of a retail jewelry store called Super Luxury Jewelry (SLJ). Prior to the crash, your firm earned $10 million in net income and Wall Street awarded you a p/e ratio of 15, resulting in a $150 million market capitalization. You pay dividends of $3 million out of net income and reinvest the rest into expansion. If there were 10 million shares outstanding, the numbers would look like this: $15 stock price, $1 basic earnings per share, and $0.30 per share dividends for a dividend yield of 2.0%. When the economy tanked, your stock fell to a p/e of only 4x earnings, resulting in a market capitalization of only $40 million. Sometimes, there is a lag between Wall Street panic and when the result of a bad economy hits the books of a firm, particularly the income statement. In the aftermath of the fall, the numbers are going to look like this: $4 stock price, $1 basic earnings per share, $0.30 dividend, with a yield of 7.5%. In other words, it looks like you could park $100,000 in the stock and earn $7,500 per year in cash dividends while waiting for the market to recover. Think of it as being paid for your patience. The problem? It’s likely that SLJ’s sales and profits are going to be hit hard because no one wants to buy a diamond bracelet when they are about to lose their house. If profits were to fall by, say, 60%, earnings per share would be only $0.40 – not $1.00 like they were last year. That makes the $0.30 dividend equal to 75% of the company’s annual profit. The Board of Directors might want to keep those liquid funds on hand to prepare for an even worse downturn to avoid layoffs or violating covenants on bank loans. The only way to fix it? You guessed right. Slash the dividend. The immediate effect of a substantial dividend cut is likely to be an enormous drop in stock price. That’s because many investors are willing to wait for things to turn around if they are getting checks in the mail (or deposited into their brokerage account, as is more often the case). When that stream of cash dries up, they aren’t so patient. Maybe SLJ is a good long-term investment. Maybe it isn't. That's not the point. The point is, if you are relying on the passive income, either to fund your lifestyle or justify an estimate of intrinsic value, looking solely at the dividend yield alone, you are exposing yourself to considerable risk. You must dig deeper into the financial statements. You need to understand the enterprise. Otherwise, you could be in for a lot of monetary pain. Is the dividend sustainable? Can it, and will it, be covered indefinitely on even materially lower cash flows and profits?